In “Doing The Work,” a four-part series from HG contributor Tiffany Lashai Curtis, four Black women who work in different industries tell us their stories. During Black Women’s History Month, we hope this series uplifts and amplifies the work of Black women in spaces where they are underrepresented or rendered invisible. Coffee has solidified its role in many of our lives. In fact, a 2018 study commissioned by the National Coffee Association found that Americans are enjoying more coffee on a daily basis now than in previous years. An entire culture exists around coffee, whether you’re quietly preparing and drinking coffee at home as a small act of self-care, meeting up with a friend at a local coffee joint, or showing your face at Starbucks so much that the baristas know your daily order by heart. And while a steaming cup of instant Folgers at home is fine (and cost-effective), sometimes the lure of a $5 oat milk latte is enough to make us head over to a café. While national coffee chains are convenient, independently owned coffee businesses can offer a more unique experience. 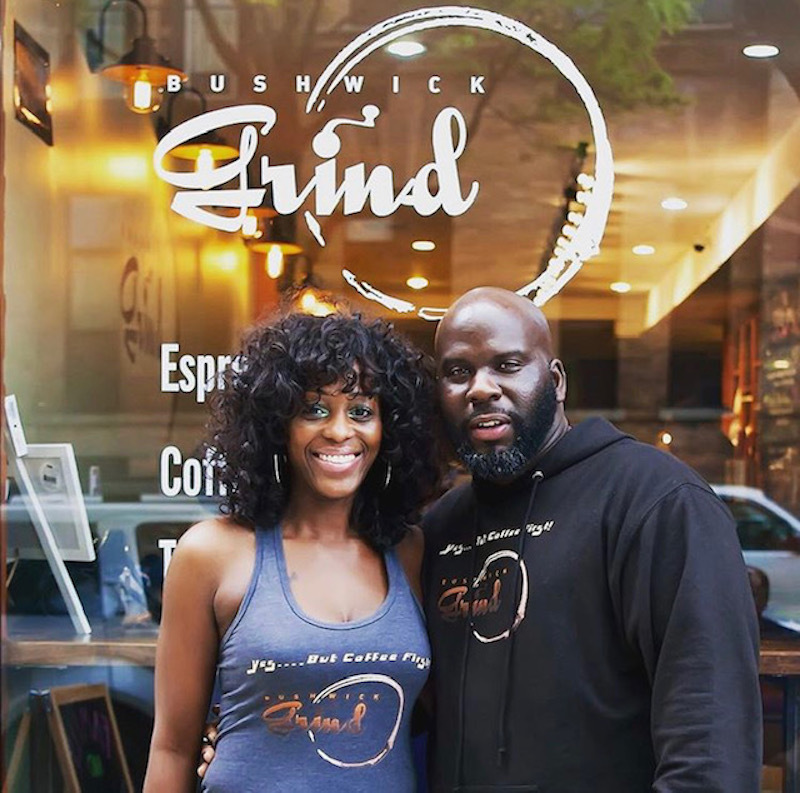 I had one such experience at Bushwick Grind, a Black-owned, full-service café located in Brooklyn, New York. I was looking for somewhere to try my first iced dirty chai on my last day in East Williamsburg. Not only did I end up having a bomb French Toast Benedict and latte, I ended up chatting with the cafe’s co-owner, Kymme Williams-Davis, who owns the establishment with her husband, Raymond Davis. 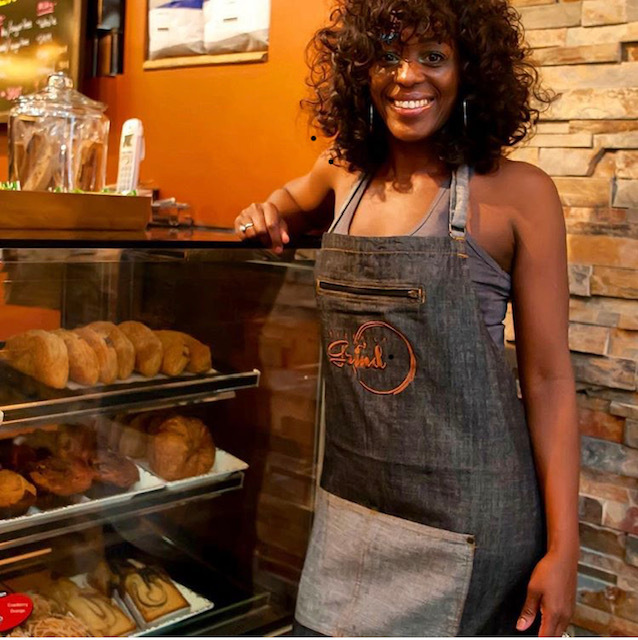 We ended up talking briefly about her experiences as a Black woman in the coffee industry, and by the time our conversation ended, I felt like I had just spoken with a long-time friend. I began considering how we never really see or even think of Black people when we envision coffee culture. I knew Kymme’s story needed to be told. For the second profile in this series, I spoke with Kymme about the highs and lows of co-owning a cafe, and the work she is doing to transform the relationship between Black people and coffee. Get into our conversation below. HelloGiggles (HG): You’re a coffee brewer who is trained in “third-wave coffee.” How long have you been a coffee brewer, and can you explain what “third-wave” means for folks who may be coffee novices? Kymme Williams-Davis (KWD): So, first-wave coffee references a time when people (in the U.S.) mostly got their coffee from grocery stores, flea markets…the big box names were Folgers, etc. Second-wave is what really made coffee popular in the U.S. with stores like Peet’s Coffee and Starbucks making coffee a social activity. Third-wave refers to smaller independent cafes like mine who purchase coffee from sustainable sources—usually directly from farmers (direct trade) or a coalition/collective of farmers (fair trade), which ensures that the people who grow, harvest, and process green coffee get a fair wage. HG: You’re also a café owner. How long have you been running your own business, and what do you feel Bushwick Grind offers that mainstream coffee shops don’t? KWD: Yes, my husband Raymond Davis and I are the proud owners. We started three years ago as a coffee shop but we have evolved into a full café in that we have a full kitchen offering healthy breakfast, lunch, and brunch. Nowadays, great food and beverage is “table stakes”—anyone can offer that. Our market differentiator is our service delivery; it is of utmost importance that we get to know our guests. We say that we don’t have customers, we have guests—guests who just happen to have to pay before leaving. When guests pay, they are not just paying for their food, they are paying for our time. Even if that is just a warm smile or full ‘counter therapy.’ Also, we are one of the few shops in the area offering healthier food options with organic, farm-to-table ingredients. Our vendors (we like to consider them partners) are mostly farmers or distributors of farmers. So our produce purchases are actually helping the New York farmers in a small way. Last, we are very community-oriented. We try our best and do our part to donate time and resources locally when we can. As we grow, we hope to do more and/or start a nonprofit arm of the business to help support our community children. HG: Coffee culture has rarely been associated with Black people. Between the cost of specialty coffee and the overwhelming whiteness of many coffee establishments, sipping and learning about coffee can be inaccessible to us. How do you think your work as a coffee professional has helped to shift the way Black people relate to coffee? KWD: That is a very true statement. I had two sisters of color tell me, inside our shop, “This place isn’t for ‘us. '” They didn’t realize my husband and I were the owners. We are in Bushwick, which is historically a Brooklyn community of Black and brown people, but 80% of our guests are not people of color. Now that we have a full kitchen, we are seeing an increase in people of color clientele, but still not so much for the coffee. In terms of cost, coffee is a very manual process, whereby a farmer is picking a fruit from a tree to get to the seed, then process it—which is a “process” in itself. This is done in most countries with people of color, and speciality coffee shops help ensure those people are given a fair wage for the work they do. I think if more people of color truly understood the supply chain of coffee, they would feel more attached to it and would feel more aligned with the culture—even the “Americanized” version of it. 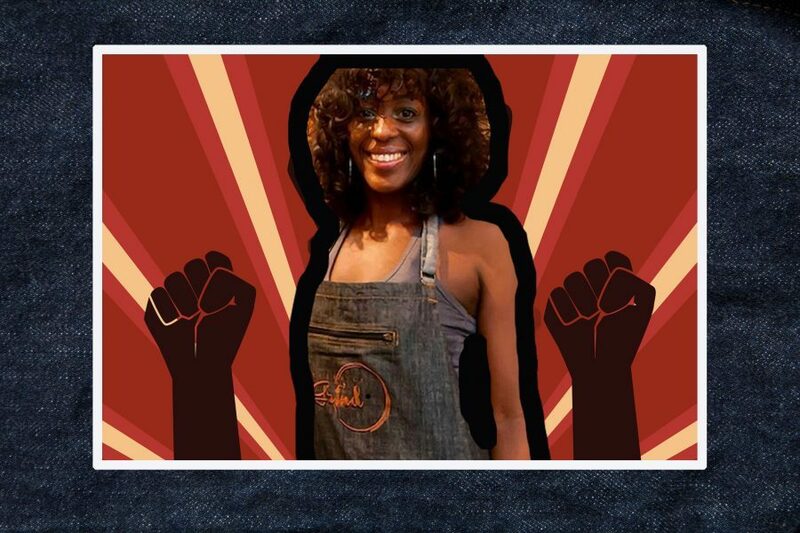 HG: Why does it matter that we have Black women in the coffee brewing industry and Black women-owned cafés? KWD: I think, like in every industry, diversity is important. Exclusion is absence and creates a void. Black women’s talents and experiences in coffee can help fill voids, as well as lend to the advancement of the industry. Black Girl Magic is impactful. HG: What highs and lows have you experienced as a Black woman working with coffee? KWD: Opening this shop with my husband has been the joy of my life. The highs, hands down, include the community we have built. Our guests truly give us life. We have met and engaged with people from all over the world, people local to Brooklyn, and people traveling or working in the area. Their stories, conversations, and vibes fuel each of us. Everyone on the team, except our newest team member, has been with us since the day we opened three years ago, so they are family. The lows, without a doubt, are the costs to run this business. With workers’ comp insurance, licensing fees, professional services fees, N.Y.C. rate utilities, private sanitation, etc. and the rising lease cost, it is so expensive to operate a retail store. Revenue does not equal profit if you cannot decrease expenses. We have to hustle seriously hard and find creative ways to generate multiple revenue streams for the business to be profitable, like catering services, hosting events, pop-up concessions, etc. HG: How would you like to see more Black women flourish in the coffee industry? KWD: When we started our research about five years ago, we listed about 15 coffee roasters who we wanted to interview as a potential source to buy our coffee from. So many said we were the first people to do that. Anyway, in visiting the big popular roasters to the smaller ones, we discovered there were little to no people of color in the back of the house. Black women should know that there is an extensive career path in the profession and science of coffee. There are positions as coffee trainers, equipment repair persons, salespersons, Q-Graders, buyers, etc. But I almost NEVER see Black women [in this industry], and if there are one or two, they are typically not American Black women—they are from a coffee-producing country and likely grew up with coffee their entire lives. There are two very well known sistas in the U.S. with national notoriety and respect in the coffee industry; they are at every Coffee Fest and SCA (Specialty Coffee Association) and BGA (Barista Guild of America) event and other noteworthy coffee event. They are always making a case for more women of color to join this industry. HG: Why is it important that Black people have spaces that feel like home—even when we’re doing something as mundane as drinking coffee? KWD: Our core values are written on an easel right near the door when you walk in the shop. It has been there since the day we opened, so our team as well as our guests are reminded of our purpose for the day. In short, it says that we strive to make our guests leave a little better than how they came. That is what is important about us having spaces. When we walk into a room, we add to the energy and vibe of that space. When we leave, we take some of that energy and vibe with us. If you are sitting in a space for five minutes or two hours, you must feel welcomed, at home, and comfortable to be yourself. HG: What’s next for you and coffee? KWD: We have invested in advanced paid training for one of our baristas who is a woman of color. She is a few course hours away from earning a highly recognized coffee industry certification. She will be one of the very few baristas on the east coast who is certified. This will ‘socially legitimize’ our shop as one that is serious about speciality coffee practices. The vision is to have the Bushwick Grind team out at latte art competitions and coffee festivals and cuppings. My husband and I will focus on running the business, and our team will grow in their skill, talents, and knowledge, which will help elevate our brand. In short, we are contributing to more Black women working and being respected in the industry. HG: Who is another Black woman in this industry that we should know about? KWD: The two women I referred to earlier, one is Michelle Jonson, known as the Chocolate Barista. I have been following her for a few years now. Her work focuses on the promotion of racial diversity and inclusion in the specialty coffee industry. In fact, there is a huge, if not the biggest, coffee event this week in Boston hosted by the SCA (Specialty Coffee Association) that I will be attending. She partnered with big-name sponsors to host a mixer for the limited people of color at this event so they will not feel isolated and excluded. She does a ton for the advancement in coffee industry; she is def Google worthy.